April 1 is possibly the funniest day of the year, and like every other year since seemingly before time began, it’s time for executives in corporations all over to loosen ties, kick off shoes, and get down to the serious business of being amusing. The result? More hilarity than an entire bag of Steve Martins, comedy no less sophisticated than Abbot and Costello, and as many “product” launches as 10 CES shows combined That’s right, it’s April Fools’ Day, and we can barely stop laughing to type these opening paragraphs. We’re so thankful it only takes place once a year, because paying more than once to have our sides stitched back together would be financially ruinous. Here are our favorite April Fools’ Day jokes for 2019. Costa knows how to do April Fools’ Day. Play it straight, don’t make videos that last for several minutes, and just stick to one punch line. Solid work, this one. Kia (won’t) offer a new steering wheel on its cars, for Millennials who have grasped Tinder, but not the art of car control. 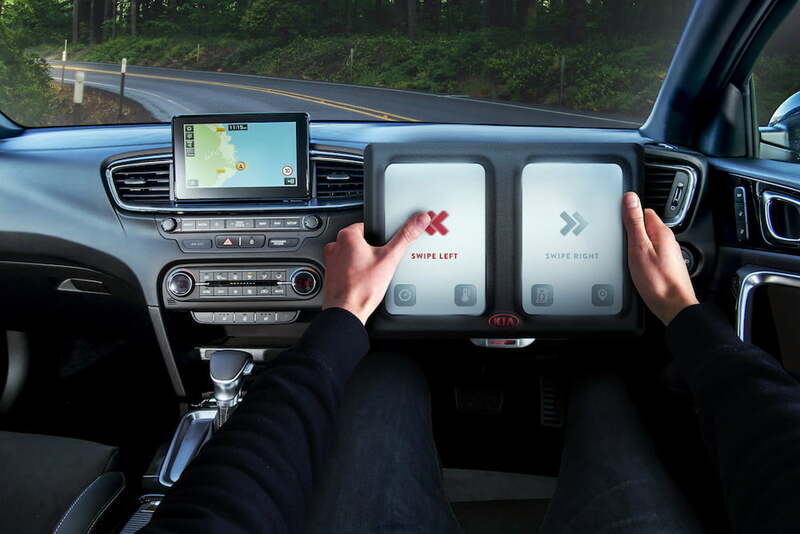 It replaces the wheel with a touchscreen, where a swipe left or right turns the car. Good so far, Kia, but calling it the Finger Operated Optimum Lever (FOOL) was a step to far. 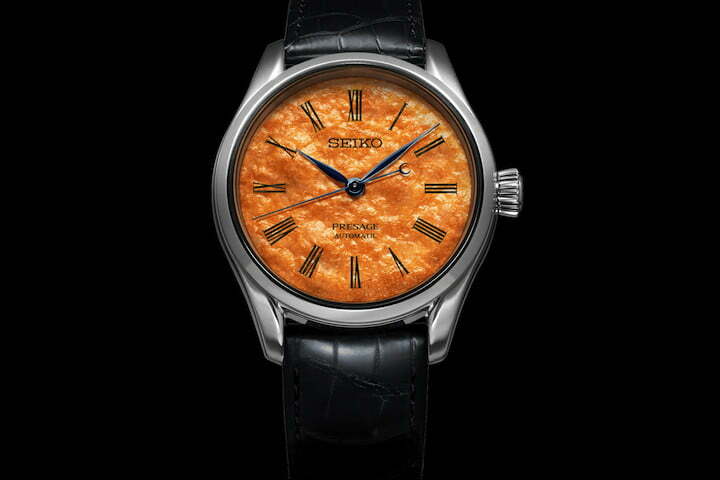 Seiko has targeted senbei, the popular type of Japanese rice cracker, to make the Seiko x Senbei watch. A stunning cracker makes up the screen, with the numerals picked out in the finest seaweed. A picture is all that’s needed to send up the watch industry here. The collaboration is another mainstay of April Fools’ madness. GlassesUSA.com and Victorinox Swiss Army have created the ultimate survival glasses, combining great eyewear with everything you want from an everyday utility knife. I know when I go to use a sharp knife, I always remove my glasses first, so this is a product that really speaks to me. Online retailer Firebox always has some new product launches on April 1. 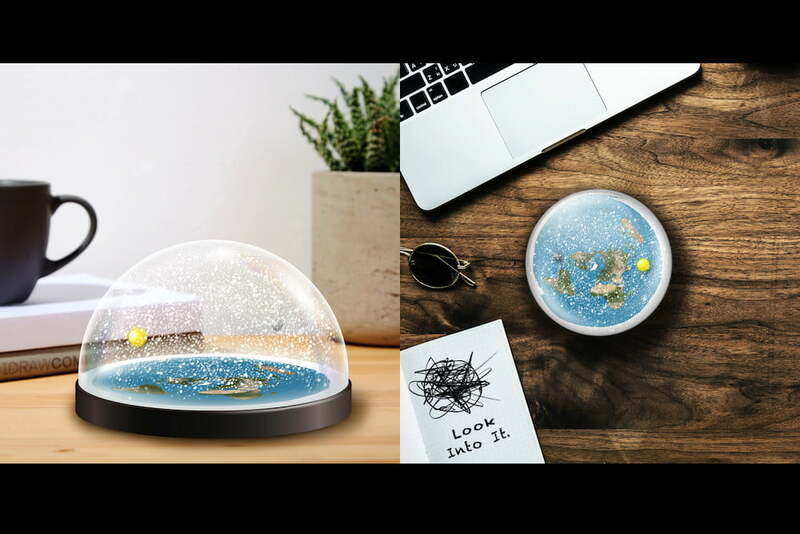 This year, it has given us the Flat Earth Snow Globe, or Snow Map, because globes are a banned word when talking about flat Earth. It’s joined by the Fyre Festival Terrarium, which isn’t quite so funny. When we say that, though, it implies the Flat Earth Snow Globe is funny, which we don’t wish to do. Paper filing systems, crayons, QVC-style TV shopping, and plenty more as OnlineLabels thinks about your privacy, and removes the risk of doing business online. It’s an April Fools’ classic — take a good joke (come on, Offlinelabels.com is quite amusing), then drag it out until the gag is gasping for breath in a too-long, two-minute video. Shutterstock has also seen the potential for amusement in pretending to take its services offline. It claims to be building the largest physical library, which will eventually contain 250 million volumes of watermarked images, and 27 tons of film reels. Except, it’s not, it’s all a big joke! We feel the need to explain that, as this one is definitely not funny, so there’s a chance it could accidentally be taken seriously. Virgin Australia will deliver Australia’s best food to you anywhere in the world. Waiting for more? Don’t, because that’s it. That’s the joke. Laugh, dammit. Google, a corporation with the money to spend on making many (many) jokes on this special day, has created Google Tulip, a breakthrough in human-plant interaction and communication. As usual with Google’s annual jokes, the production value is high, the silliness is similarly up in the air, and the vague whiff of plausibility in the age of artificial intelligence makes it watchable. Like a Terminator of tomfoolery, Google absolutely will not stop with the jokes. This is Screen Cleaner, which keeps your phone clean on the outside, using a special haptic vibration system and the Smudge Detector API. Google, just as it does with messaging apps, throws everything at the wall with April Fools’ Day. Some of it sticks, others, like the Screen Cleaner, slide down said wall leaving a worrying stain in its wake. Anyone learning another language knows that you have to practice often to improve. Duolingo’s solution, outside of push notifications on your phone, is to send a massive version of its mascot, Duo the owl, round to make sure you stick with your lessons. You’ve got 50 seconds of set-up before the joke turns up, but it’s worth it for some moderate amusement, which makes it better than most other attempts. This one will develop during the day, as OnePlus seems to have a lot planned for its Warp Car, which integrates phones into cars “in ways never before seen in the automotive industry, including replacing the steering wheel with a smartphone.” For now, there is a teaser video and a website, with added promotion for the OnePlus Warp Charge features, which charges your phone for up to a day’s worth of use in only 20 minutes. 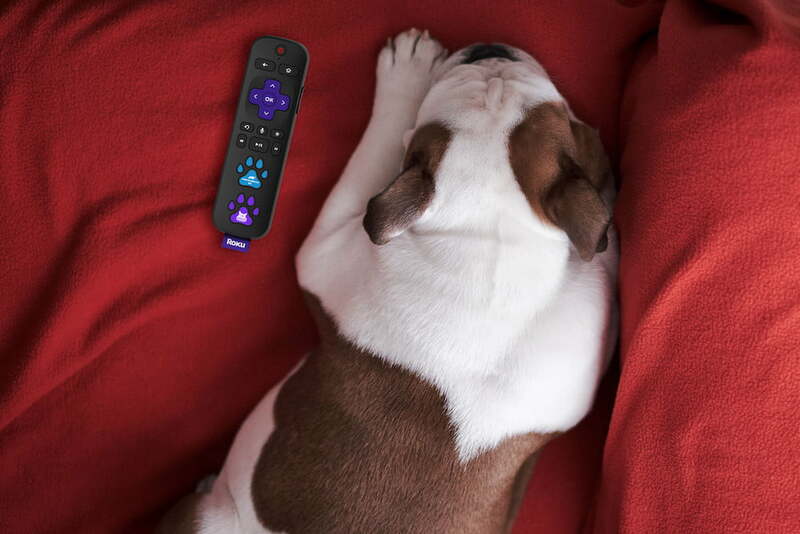 Roku has got a remote control designed to make it easier for pets to take control of the TV. Actually quite amusing, Roku gets a point for various excellent puns, and many points for using cute pets in its video — a surefire winner for April Fools’ Day — and also for the bark-to-play and bark-to-mute controls. There’s even a sub-WOOF-er inside. Puntastic, Roku. I admit it. I laughed when T-Mobile CEO John Legere closed the door to the BoothE and we couldn’t hear what he said, and when his trademark swearing was beeped out at the end of the video. That’s more than most gags manage on April 1, so congratulations to T-Mobile. The BoothE, in case you’re bothered, is a phone booth to isolate you from the sounds of the world so you can use your phone in peace. Stopped being funny now, didn’t it? FreshDirect, the online grocery delivery service, gets April Fools’ right by lampooning a trend that’s begging for it — the alternative milk business. FreshDirect’s answer is Caulk, a non-milk product made from cauliflower. Best part? The voiceover says it’s like “clouds that have been pureed.” Genius. No, not the Passport, the Pastport. A ’90s-themed trim level for Honda’s latest SUV, it brings back all those awesome ’90s car details including a cassette player, a single button on the steering wheel, and a holder for your pager. Our favorite part? The commercial has been shot in 4:3 aspect ratio for playback on a good old standard television. Burping. That’s funny, right? No, not really. How about when you burp … in space? Hilarious! Well, the answer is still no, but that’s the “science” behind the SodaStreamMe, a product designed with astronaut Scott Kelly, who has now taught April Fools’ gaggers everywhere that the almost impossible is possible. The SodaStreamMe is supposedly a device for the Earthbound to collect their burps into sparkling water. Yep, went down like a fart in a space suit for us, too. Dating app Tinder hasn’t come out and said this is a joke, but we’re confident it is. In an effort to avoid being “height fished,” the app will add an HVB (that’s Height Verification Badge) to profiles where it has authenticated height claims. Daters will have to submit a photo of themselves standing next to a commercial building, and Tinder’s algorithms will work out if the claim is accurate. Yeah, definitely a joke. The RadFit is a stationary bike with an electric motor that does the workout so you don’t have to. There are wheels on the frame, so you can take it anywhere, even to spin class. Rad Power, which makes ebikes, says it’s a response to those who call electric bikes “cheating,” which it doesn’t believe is true. So it has made one that actually is cheating. Using new Avocaudio technology, JBL has upgraded its massive PartyBox 300 so that only millennials can hear it. Those under 35 years old, even when standing right next to the speaker, will be unaware if it’s playing at all — except when a millennial is dancing, as the cringey video shows. Beer, for all its benefits, is difficult to carry and store in quantity. This is(n’t) Kingfisher Instant Beer. There are two packets — the beer powder, and a carbonated water powder packet — inside the easy-to-carry box. Open them up and add to chilled water, for an anytime/anywhere beer party. Ridiculous, but we bet there are people out there who would love this to be a real product. After we’ve recovered from collating so much corporate amusement, we’ll be adding to this list throughout the day, so check back later for more. Updated on April 1, 2019: Added Costa Coffee, Shutterstock, Virgin Australia jokes, and several others.